SEATTLE – A new scientific study provides the first evidence-based assessment of pandemic potential in Africa prior to outbreaks and identifies ways to prevent them. The study, published today in the international medical journal The Lancet, examines the potential for the widespread onset of Ebola or other lethal viral hemorrhagic fevers emanating from communities in African countries. A team of international researchers examined the relative likelihood of four deadly viruses emerging and spreading at several key stages in a possible pandemic, charting and quantifying progress from the first human case through to a widespread epidemic. 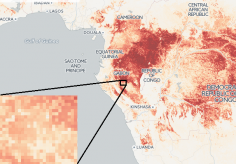 Data visualizations from the paper are available at https://vizhub.healthdata.org/lbd/pandemics. By mapping the greatest vulnerabilities for initial cases to escalate into epidemics, more precise preparedness activities can be implemented. Researchers focused on four diseases – Ebola virus disease, Marburg virus disease, Lassa fever, and Crimean-Congo hemorrhagic fever – since the way they move from animal sources to humans is similar. The study’s results showed considerable differences in the potential for these pathogens to spread both between countries as well as within and among communities in an individual country. For example, researchers identified stark contrasts in the vulnerability between Nigeria’s northern and southern states. While the study identifies at-risk locations that have witnessed outbreaks, it also highlights large areas of the continent currently considered not at risk, much like Guinea prior to 2013, when the transmission of the Ebola virus led to more than 25,000 reported cases and 10,000 deaths in three countries, according to the World Health Organization. Parts of Central African Republic, Chad, Somalia, and South Sudan rank as highly vulnerable to any outbreak. Areas around the Congo River in Central Africa rank highest for local outbreak potential for Ebola and Marburg virus disease. In contrast, parts of West Africa rank highest as sources of widespread epidemics for all four viruses. For example, Guéckédou prefecture in Guinea, where the 2013–2016 Ebola outbreak originated, ranks as one of the most likely districts for an individual Ebola case to result in a widespread epidemic. Such efforts can range from focusing on surveillance of animals involved in transmission, rapid detection of the first case of an outbreak, or providing resources for improving health systems prior to the next outbreak. Similarly, after an outbreak has started, assessments could guide future vaccination efforts to contain any local outbreak and stop further spread. IHME researchers and collaborators contributing to the study anticipate refining and expanding the framework in the future, according to Dr. Pigott. For interviews with Professor Peter Piot, please email [email protected] or phone +44 (0)207 927 2802, or contact either Ms. Bienhoff or Mr. Owen. Established in 2007, the Institute for Health Metrics and Evaluation (IHME) is an independent global health research center at the University of Washington in Seattle that provides rigorous and comparable measurement of the world’s most important health problems and evaluates strategies to address them. IHME makes this information available so that policymakers, donors, practitioners, researchers, and local and global decision-makers have the evidence they need to make informed decisions about how to allocate resources for improving population health. For more information, visit www.healthdata.org. The Local Burden of Disease project at IHME aims to produce estimates of health outcomes and related measures that cover entire continents, but to do so at a very fine, local resolution.